Since its founding in 1998, Private Musicke, under the direction of Pierre Pitzl, has appeared at various European early music festivals (Resonanzen Wien, Lucerne Festival, Edinburgh Festival, Festwochen Innsbruck, Helsinki Festival, London Wigmore Hall, Amsterdam Concertgebow, Berlin Kammerphilharmonie a.o.). Several CDs for the ACCENT have been released; they have been distinguished with critical acclaim and international prizes. The CD “Lettere amorose”, released in 2010 with the soprano Magdalena Kozena by Deutsche Grammophon, was awarded with the Diapason d’Or. The guitar is an instrument especially inviting for improvisation. This goes for the 17th century as well as nowadays. Many of the pieces on this CD are written like sketches asking for further development. 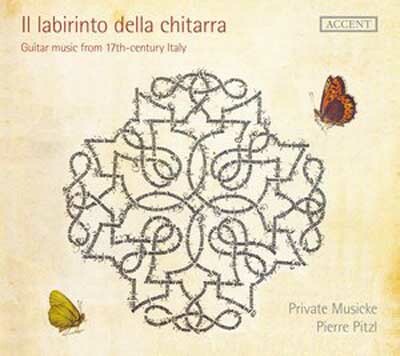 Private Musicke took up those stimulating suggestions and turned them into a program providing a colourful and diverse image of the Italian art of guitar music in the 17th century.